Dialysis is an important treatment for kidney failure – when the kidneys stop working properly. 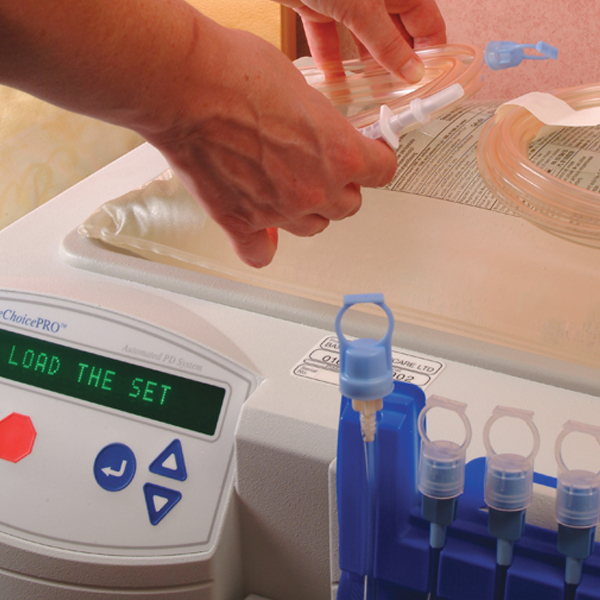 Dialysis uses special equipment to remove extra water, salt and waste products from the blood. This partly replaces the work of healthy kidneys. Your child may need dialysis if he or she is in kidney failure – this may happen suddenly or over time. There are two main types of dialysis – haemodialysis and peritoneal dialysis. Both of these require surgery before the dialysis can start. In many cases, families can decide the best type of dialysis for their child, in discussion with their healthcare team. Dialysis is a life-saving treatment for children in kidney failure. Dialysis is a complex and time consuming treatment which will impact your family life. Your child’s healthcare team will give you more information and support you and your child throughout treatment. how to support your child on dialysis. Your child may need dialysis if he or she is in kidney failure. The term kidney function is used to describe how well the kidneys are working – especially how they filter blood and make urine. In kidney failure, the level of kidney function is too low to support the body. This may happen suddenly or over a long time. Acute kidney injury (AKI): in AKI, the kidney function gets worse over a short period of time. Some children with severe AKI need dialysis for a few weeks or longer until their kidneys start working again. Chronic kidney disease (CKD): in some children with CKD, the kidney function gets worse over a long period of time. CKD has five stages, and kidney failure happens in stage 5. It is also called end stage renal failure (ESRF) or established renal failure. Most children with stage 5 CKD need dialysis and/or a kidney transplant. Dialysis is one type of renal replacement therapy. This means it partly replaces the work of kidneys (“renal” means to do with the kidneys). The two main types of dialysis work in different ways, but their job is the same – to clean the blood. Dialysis removes extra water and waste products from the blood. If these are not removed, they might build up in the body and cause illness and fluid overload (too much water in the body). Dialysis also makes sure there is a balance of chemicals in the blood – especially potassium, which can be dangerous in large amounts – and that the blood is not too acidic. Dialysis does about 10–15% of the work of healthy kidneys. However, this is enough to make sure the body keeps working. Some children feel better after starting dialysis and/or have a better appetite. Your child will be assessed while he or she is on dialysis, and may need to continue restricting what he or she eats and drinks. Dialysis does not do everything that kidneys do – such as help keep bones healthy and make red blood cells. Your child will take medicines to help with this. Your child’s healthcare team will work out the most suitable dialysis treatment for your child, after talking to you about your preferences, and working out your child’s individual health needs. There are two main types of dialysis. Haemodialysis (HD) – using a machine with an ‘artificial kidney’. Blood is pumped out of the body and into the artificial kidney, and the cleaned blood is returned to the body. Each dialysis session takes 3–4 hours, and is done three or more times a week. Haemodialysis usually takes place in the hospital, but some children are able to use haemodialysis at home. Peritoneal dialysis (PD) – using the peritoneum, which is the lining of the abdomen (tummy). A special fluid is put into the abdomen, where it sits for a few hours or longer while the peritoneum filters the blood. The used fluid is drained out of the body. This can take place overnight or several times a day. Your child’s healthcare team will give you information so you understand the benefits and risks of each type. In many cases, families can decide the best type of dialysis. However, a few children need a particular type. Before dialysis can start, your child will need a procedure to get access to his or her body. This depends on the type of dialysis and how quickly it is needed. A central venous line (or line) is a long, thin tube (catheter) that is placed into one of the large blood vessels in the body. This is usually in the neck or chest, or occasionally the groin. For short-term use, a temporary line can be placed. For long-term use, a permanent line can be placed in theatre, under general anaesthetic. Another option for long-term use is a fistula – two blood vessels are joined up to make one larger, stronger blood vessel. This is done several weeks before dialysis starts. A catheter is placed through the tummy wall. 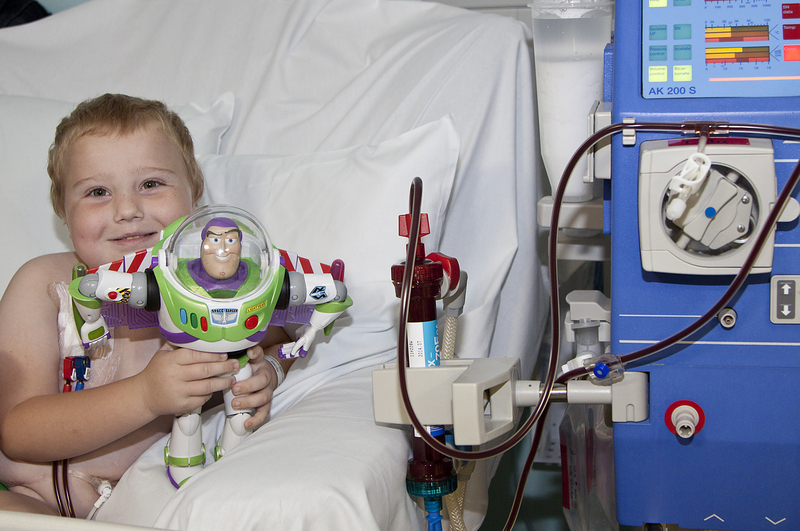 Dialysis is a crucial, life-saving treatment for children in kidney failure. The vast majority of children with kidney failure are able to have this treatment. However it has side-effects, has an impact on your child’s and family’s lifestyle and carries risks. The catheter – a long, thin tube that is inserted for some types of dialysis – may become infected. Your child’s healthcare team will show you how to care for the catheter and the skin around it (exit site) to reduce this risk and check for signs of infection so it can be treated quickly. Some children feel more tired than usual after being on dialysis. There may be other side-effects and risks, depending on the type of dialysis. Dialysis is a complicated treatment, and it will have a large impact on your child’s and family’s lives. If your child has dialysis at home, you will be trained to use the equipment. If your child has dialysis at the hospital, he or she will need to travel to the dialysis unit three or more times a week. Dialysis, and living with kidney failure, can also have a huge emotional impact on a child and family. There are also some specific risks of each type of dialysis. For children with renal failure (stage 5 CKD), the best treatment for kidney failure is a kidney transplant. However, having a kidney transplant depends on a suitable kidney donor – deceased or live – being available and the child being ready to have a kidney transplant. After a successful kidney transplant, and by taking medicines to protect their new kidney, children can live full and healthy lives. The timing of kidney transplantation depends on many factors, including the availability of suitable donors. Some children need to have dialysis while they wait for this procedure. Babies and younger children under 2 years may need to wait until they grow large enough to have a kidney transplant. If children with kidney failure do not have dialysis or a kidney transplant, their kidneys will eventually stop working until they can no longer support the body, and these children will eventually die. This is called conservative treatment or palliative treatment. Children are made as comfortable as possible – but may continue taking medicines and restricting their diet and fluid intake to manage symptoms. A very small number of babies and children with kidney failure may not benefit from dialysis. Choosing not to start or continue with dialysis is a very difficult and personal decision. Your child’s healthcare team will support you and your family throughout this time. Your child’s paediatric renal unit – a specialised unit for children with kidney conditions – will manage your child’s dialysis. If your child is having haemodialysis at the hospital, it will take place here. You will be introduced to a team of healthcare professionals who will support your child and family throughout his or her dialysis. Your child will be continue to be looked after by a paediatric nephrologist, as well as renal nurses, who specialise in looking after children on dialysis and will check that your child is growing and they are as healthy as possible. Dialysis can be a difficult and stressful experience for your child and the whole family, . You and your child will learn more over time about how to help live with dialysis. Your child’s healthcare team is there to help you. They can provide support with your child’s education, accessing financial benefits and planning holidays around dialysis. There are two main types of dialysis – haemodialysis and peritoneal dialysis. (These are also called different modalities.). Both types remove waste and water from the blood. This section gives an introduction to these two types of dialysis, so you understand the benefits and risks of each type, and the surgery that is needed. In many cases, you will be able to decide the best type of dialysis for your child. 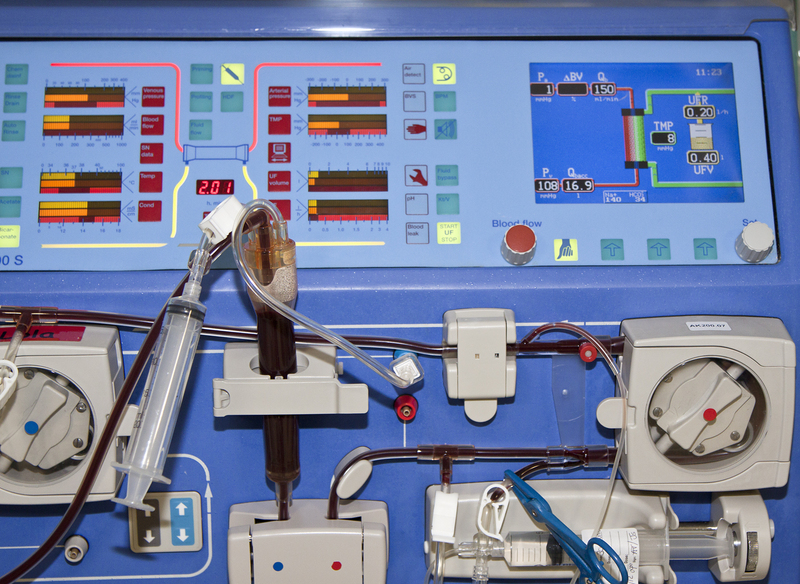 In haemodialysis, a machine with an ‘artificial kidney’ filters the blood. Blood is pumped out of the body through tubes and into the artificial kidney, and the cleaned blood is returned to the body. This form of dialysis is often shortened to HD. For each dialysis session, the patient is connected to the haemodialysis machine, either through a long plastic tube that has been inserted into his or her body (the central venous line, or line) or using a needle or needles placed into blood vessels that have been joined up (a fistula). The machine pumps blood out of the body through tubes and into a dialyser or artificial kidney. This sits outside the machine. The machine pumps special fluid called dialysate into the dialyser. Waste products, salts and excess water are filtered out of the blood and into the dialysate. The cleaned blood is then pumped back into the body. How often is haemodialyis needed and how long does it take? Each dialysis session usually lasts 3–4 hours and is normally done during the day. Most children have sessions three times a week, though they may need it more often. Although children are connected to the machine, they can read, play and, importantly, spend time doing school work with a teacher. Where does haemodialysis take place? Hospital haemodialysis – most of the time haemodialysis takes place in a special area in the paediatric renal unit in a hospital. This means your child may need to travel some distance. Home haemodialysis – some children have haemodialysis in their home. This depends on many factors, including the availability of this service, whether your home can accommodate the equipment, how far you live from the unit, the time needed to train you to run haemodialysis, the time your child is likely to be on dialysis, and his or her age and size. In peritoneal dialysis, the peritoneum, which is the lining of the abdomen (tummy), filters the blood. What happens in peritoneal dialysis? For each dialysis session, the patient is connected to the peritoneal dialysis equipment and special fluid called dialysate is passed into and out of the body. Each time the dialysate is passed into and then removed from the body is called an exchange. Each exchange consists of three phases; a fill, a dwell and a drain. During the fill phase, the dialysate flows from a bag through a catheter (a long, thin tube that has been placed before dialysis starts) in the abdomen. It passes into the peritoneal cavity, the area inside the abdomen (tummy). The dialysate stays in the abdomen for a set period of time. This is called the dwell. During the dwell, the waste products, extra water and salt filter out of the blood and into the dialysate. This happens because of a process called diffusion. At the end of the dialysis session, the fluid with the waste products, extra water and salt is drained out of the abdomen into another bag, and then thrown away. This is the drain phase. There are two types of peritoneal dialysis, which affect how long and how often the exchanges take place. Continuous ambulatory peritoneal dialysis (CAPD). Exchanges usually take place four times a day. The dialysate is in the abdomen for about 4 hours each time. Each exchange needs to be done by you or another responsible person. Where does peritoneal dialysis take place? Most of the time, peritoneal dialysis is done at home. It can also be done in other places, such as school or other family members’ homes. It may be possible – or sometimes necessary – to change the type of dialysis your child has. This may depend on your child’s health and complications of dialysis, how he or she is responding to dialysis, or your family’s situation. Speak with your child’s healthcare team. Before dialysis can start, your child will need to have a catheter or line put into his or her body. This depends on the type of dialysis and how quickly dialysis is needed. Your child will have an anaesthetic, special medicine, so he or she can sleep through the procedure and not feel any pain. There are different ways to get access to your child’s body for dialysis. A central venous line (or ‘line’) is a catheter, a long, thin tube (catheter) that is placed into one of the large blood vessels in the body. This is usually in the neck or chest, or occasionally the groin. 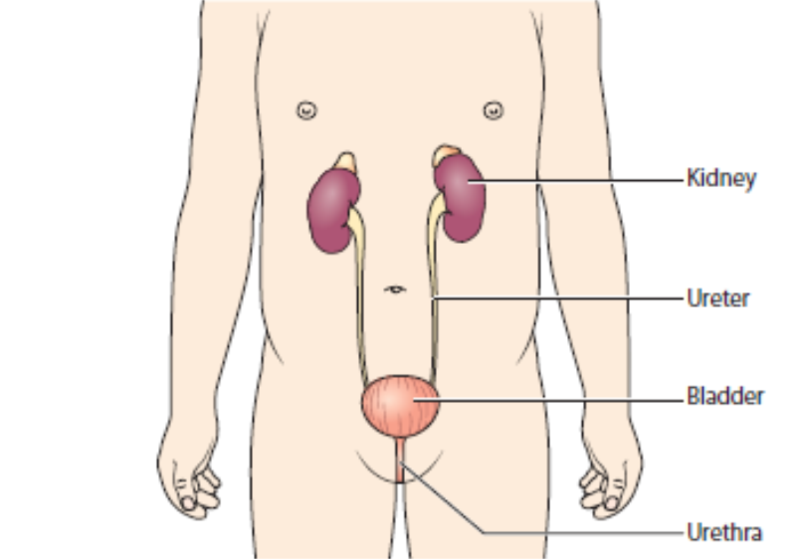 There are two ports at the ends of the catheter, which connect to tubes for each dialysis session. A line can be inserted shortly before the first dialysis session starts. There are two types of lines. Permanent line – for long-term dialysis. The catheter is inserted in the vein and then tunnelled under the skin to exit in a different position. For example, if the catheter is inserted in the neck, it will exit on the front of the chest. This means that the exit site cannot be seen when your child wears a shirt or blouse. An arteriovenous fistula, or fistula, is a connection between two types of blood vessels, a vein and an artery. This creates a larger, stronger blood vessel. For each dialysis session, one or two needles are inserted into the fistula – because it is a larger, strong blood vessel, it is easier to access. A special gel or cream can be used to stop your child feeling any pain. The fistula is usually made in an arm (the arm that your child does not draw or write with). It needs to be made at least 8–12 weeks before the first dialysis session, so the vein has time to enlarge. Patients feel a ‘buzzing’ in the area around the fistula, and are shown how to take care of it. For most children who will be on dialysis long term, a fistula is the best option for haemodialysis – it usually lasts longer and has lower risks of infection. A peritoneal catheter, a soft plastic tube, is inserted through the abdomen (tummy). A small cut is made in the abdomen to make a small hole. A catheter is inserted through the hole into peritoneal cavity. Children usually stay in the hospital overnight or longer to give time to heal. The place where the catheter comes out of the skin is called the exit site. It needs regular dressing changes. Dialysis takes place in a paediatric renal unit, a specialised unit that treats babies, children and young people with kidney conditions, or at home. Your child will be looked after by a paediatric nephrologist, a doctor who treats babies, children and young people with kidney problems. If for any reason your child needs to be admitted to hospital, he or she will probably need to go to the paediatric renal unit rather than to your local hospital. Your child’s healthcare team will show you how to care for your child’s exit site & catheter to reduce any risks and watch out for signs so any complications can be treated quickly. Inserting a central venous line (or line): common risks include bleeding, bruising and formation of a blood clots around the end of the catheter. Creating a fistula: risks include bleeding, or failure to develop, which may mean that a repeat operation or a graft needs to be made instead. ‘Steal syndrome’ in a fistula – where there is less blood flow to the hand, which may cause a feeling of tingling, numbness or cold in the hand, and may require surgery. Infections due to germs entering the body – this is more likely in a line than in a fistula. Keeping the exit site clean will reduce the risk. Most infections can be treated with antibiotic medicines, which kill germs. If they are more serious, surgery and/or a new line may be needed. Blood clots (thrombosis) – if this happens in a line, fistula or graft, it may stop working. low blood pressure (hypotension), which may be sudden – children may feel weak, dizzy or light-headed, or sick. Your child’s healthcare team will train you how to manage peritoneal dialysis and care for your child at home. They will also give you information about what to look for, so any complications can be treated quickly. One common complication is when fluid (liquid) does not properly drain out of the peritoneal cavity. This may happen for different reasons. The catheter may become kinked or blocked, such as when a child lies on it (for example, rolling over at night) – this can usually be easily corrected. Occasionally, the poor drainage keeps happening. This may be because the catheter gets displaced, or omentum (a fold of tissue in the abdomen) gets wrapped around the catheter. The catheter will usually need to be replaced if this occurs. Some children who have previously had surgery in the abdomen may have adhesions. If this happens, peritoneal dialysis may need to be stopped and haemodialysis considered as an alternative. Infections due to germs entering the body – especially peritonitis, which is an infection of the peritoneum. Keeping the exit site clean will reduce the risk. Most infections can be treated with antibiotic medicines, which kill the germs. If the infection is more serious, the catheter will need to be removed, and a new catheter placed after the infection is gone. Hernias – happen when an internal part of the body pushes through the wall around it and a lump in the tummy or groin can be seen. Dialysis can be a difficult and stressful experience for your child and the whole family, including other children. You and your child will learn more over time about how to live with dialysis. Your child’s dialysis team is there to help you. Some of the ways you and your child can get further support include the following. Education: your child’s schooling may be interrupted, especially if he or she has to go to the hospital frequently. Teachers are available to spend time with all school-age children as soon as they are well enough. The teachers make contact with the individual schools and take an active role in continuing each child’s education. Money: sometimes helping to looking after a child on dialysis can put a strain on household finances, especially if one parent or carer gives up work or works fewer hours. A renal social worker can help you access financial benefits from the government. Holidays: dialysis may make it more difficult to plan family time such as holidays or visiting other family members. Speak with your team about how to plan this time away so that it fits around your child’s healthcare needs. Speaking with other families: ask your hospital about meeting with other families of children on dialysis. Talking with parents and carers who have gone through similar issues can be a huge source of support. When your child reaches adolescence, he or she will prepare to transfer from paediatric services (for children) to adult services. The timing is different for each person – though most will start being looked after by an adult nephrology unit by the time they are 18 years old. This is the end of the information on dialysis. If you would like to read more about haemodialysis, peritoneal dialysis, kidney conditions, tests and diagnosis, other treatment or supporting information, you can find a list of topics covered on the infoKID website at www.infoKID.org.uk.